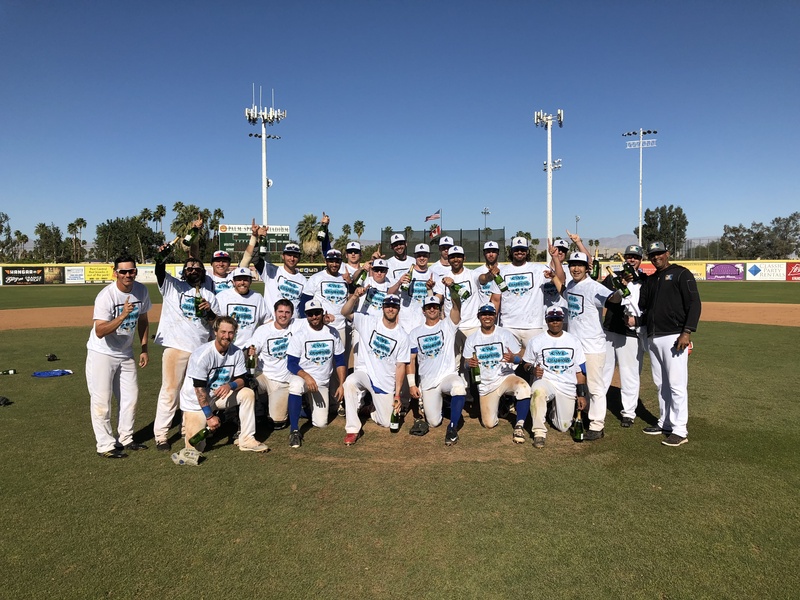 PALM SPRINGS, Calif. — It started with 10 teams in late January and it ended with one champion as the Washington Blue Sox defeated the Manitoba North Stars, 10-3, to win the 2018 California Winter League title. After being shutout through the first five innings of the game, the Blue Sox’ bats broke out for a six-run sixth inning. The North Stars led 3-0 going into the bottom of the fifth when the game changed in a hurry. Gary Aho, who started for Manitoba, dominated through four innings but ran into trouble in the fifth. KC Huth led off the fifth with a single and two batters later, Marc Culmer hit a two-run home run off the scoreboard in left-center field to trim the North Stars’ lead. After Culmer’s homer, Aho then walked Kailer Smith, and Nicholas Lawrence came into the game to relieve Aho. Lawrence walked Kyle Stahl and Dallas Seidel singled to center to load the bases. Carson Lee followed with a two-RBI single to left field to give the Blue Sox a one-run lead, then Zach Compton hit a two-RBI single of his own off Joe Dougherty to make it 6-3 Washington after five innings. Kane McCall, who came out of the bullpen for the Blue Sox with one out in the fifth, pitched a perfect sixth inning, and at that point all the momentum was on Washington’s side. They added two runs in the seventh to make it 8-2 after Lee hit another two-RBI single with the bases loaded and two outs. The Blue Sox tacked on two more runs in the eighth on Culmer’s RBI double and Smith’s RBI single to go up 10-3. McCall finished off the job, pitching a one-two-three top of the ninth. Charles Misiano lined out to Huth in center field to end the game, and the celebration ensued for the victorious Blue Sox. McCall got the win, going four and two-thirds innings in relief with five strikeouts and no walks, allowing just two hits and one run. Yuta Kikuzaki started for the Blue Sox and pitched three perfect innings before allowing one run in his four solid innings of work. 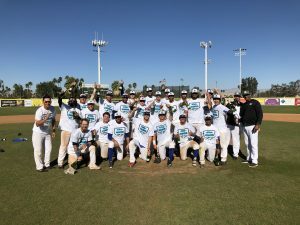 Will Krug had an RBI single, one stolen base and two runs scored for the North Stars, while David Kerian and Adrian Guzman each had RBI singles. Lawrence suffered the loss and failed to record an out, facing just three batters. Lee was the main standout star in the Blue Sox lineup and earned Player of the Game honors. The third baseman went 3-for-5 with three singles, four RBI, one stolen base and one run scored. Culmer had a big game as well, going 2-for-4 with two runs scored and a walk on top of that fifth-inning homer. Eight of the nine Blue Sox starters had at least one hit, four had two hits, all nine reached base safely and seven of them scored at least one run. In the end, the Blue Sox racked up 10 runs on 13 hits, overpowering the North Stars to win the CWL championship in convincing fashion.